To speed up browsing chrome stores website resources in it's cache so it need not fetch them though the internet every time. That includes almost all parts of the web page excluding certain items like videos and widgets. But these are used only when you are online. Accessing cached pages offline in chrome. Open the url "chrome://flags/" in chrome. Search for option "Enable Offline Load Stale Button" and set it to "Enabled". Restart is necessary to enable the feature. Scroll down and hit the "relaunch" button. 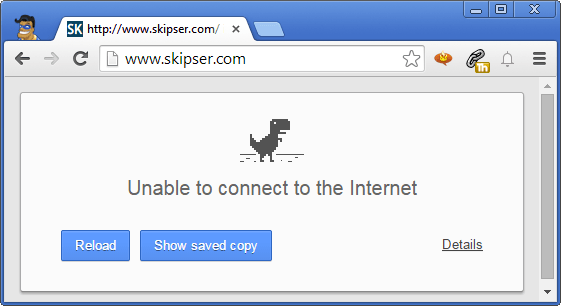 Now if you try to load a website while being offline, chrome will again show the T-Rex unable to connect message, but with an extra button - "Show saved copy". Hit this and the cached copy of the website will be shown to you. Please note that not all websites can be viewed offline. Sites like Facebook which load their content dynamically can't be shown using cached content. Hence you won't find he "Show saved copy" button if you try accessing them offline. Chrome has an offline mode option kept hidden deep inside. Here's how you can unlock it.